Truck accidents often result in serious injury and sometimes even death. As Rhode Island truck accident attorneys, Tapalian Law is a personal injury firm with an expansive team of legal professionals ready to handle your truck accident case. Our truck accident lawyers serve injured people in Rhode Island and Massachusetts. We work on a contingency basis, which means we don’t get paid until you win your case. 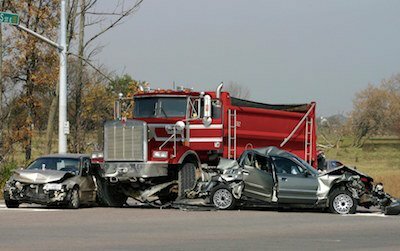 If you are injured in a crash and cannot come to us, a Rhode Island truck accident lawyer from our practice will personally visit you at your home or in the hospital to offer you a free consultation about your legal rights. The consultation is free, there is no obligation, you don’t pay until you win. This really is a win-win situation, you have everything to gain and nothing to lose. Contact a RI Truck Accident Lawyer today. When you’re in a car accident involving a commercial truck, big-rig, tractor trailer or other vehicle, recovery can only be made by proving that the accident was the fault of the other driver. Establishing proof is crucial. A knowledgeable personal injury lawyer well-versed in Rhode Island personal injury law can help you. Experienced with cases where a truck, big-rig, or tractor trailer has hit a vehicle, the truck accident attorneys at Tapalian Law know just how important it is to identify witnesses, consult with police officers, and if needed, obtain accident reconstruction professionals. The laws governing trucking accidents are extremely complicated and most car accident lawyers don’t understand the intricacies of the federal motor carrier safety laws as they relate to accidents involving trucks, big-rigs, or tractor trailers. Even if the other driver has insurance coverage, it may not be enough to cover all the injuries incurred in the vehicle accident. In cases such as this, the best truck accident attorneys know how to identify other sources of insurance coverage, including under insured and uninsured policies, employer’s policies, umbrella policies, and, in some cases, even homeowner’s insurance. Tapalian Law will work for you to establish fault with the other driver, highlighting the scope of the injuries incurred, and making sure there are enough proceeds to pay the settlement in your truck accident personal injury case. When you are hurt in a truck accident with serious personal injury, you must have a firm with experience. When choosing a personal injury attorney, the right law firm makes a difference. You should consult an attorney who has extensive motor vehicle accident experience. Tapalian Law is a firm dedicated to helping the injured and well versed in auto and truck accident injury cases. Our RI personal injury law firm has extensive contacts in the medical community to assist our clients in documenting the seriousness of the injuries resulting from the car accident. Even the simplest car accident injury claim can become complicated quickly. Don’t risk a mistake that could hurt your chance at recovering compensation, put our years of experience to work for you. It is vital that measures be taken promptly to preserve critical evidence, investigate the accident in question, and file a lawsuit prior to the deadline imposed by the RI statute of limitations. If you or a loved one has been injured, don’t delay. Contact RI Personal Injury Attorney David Tapalian today for a free legal consultation. There is never a fee or any costs unless we are successful. We will help you so that you understand your rights and obligations under the law. Sleep Deprived Drivers May Be as Dangerous as Drunk Drivers There's more bad news for the chronically sleep deprived. Not only are they perpetually tired but also more at risk for causing a car accident.